Omaha, Nebraska. April 4, 2016 – LeaseTeam, Inc., the premier solution provider in the equipment leasing and finance marketplace, is pleased to announce that Blue Bridge Financial, LLC (“Blue Bridge”), a direct lender and national provider of small business financing, has selected ASPIRE as its end-to-end lease and loan management platform. 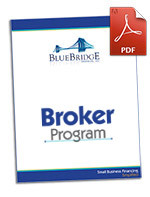 Recently recognized as the fastest growing company in Western New York, Blue Bridge provides simple lending alternatives to traditional funding. The company has grown more than 300 percent in the previous two years and was in need of a seamless technology solution to support its continued growth. ASPIRE was chosen following a thorough search of integrated front- and back-end systems because of its immense scalability and customization. LeaseTeam, Inc. is a market-leading software and business solutions company serving more than 250 financial organizations throughout North America and the United Kingdom. With more than 25 years of experience and expertise in the equipment finance and leasing industry, its innovative technologies continue to streamline lease and loan processing for users. LeaseTeam’s ASPIRE™, an end-to-end lease and loan management platform, allows businesses to stop talking about front- and back-end processes, and start talking about managing the total transaction lifecycle—from a single system. For more information about LeaseTeam or ASPIRE, call 402-493-3445 or visit www.LeaseTeam.com.